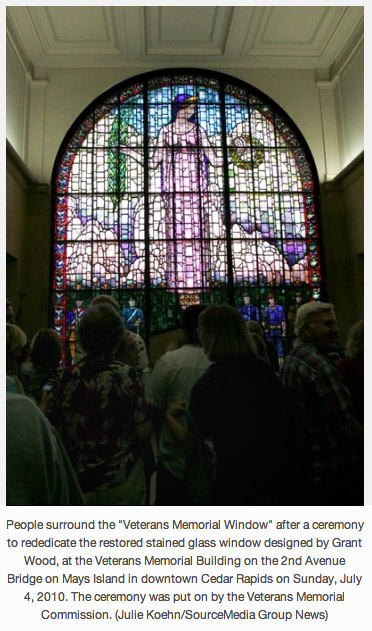 Van and Bev Becker alert us that the historic Grant Wood window damaged in the 2008 flood in Cedar Rapids has been restored and reinstalled along a route of the Lincoln Highway. 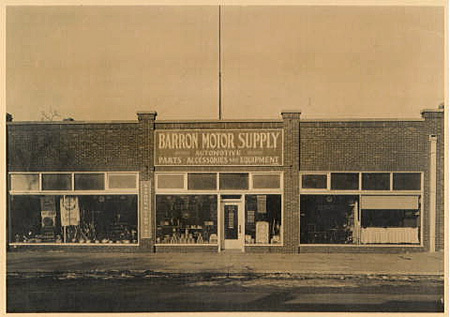 It is in its original location in the Veterans Memorial Building and facing 2nd Avenue, which was the Lincoln Highway from 1916–1928. Restoration has taken two years and as Van says, it is a significant step in recovery from what is being called the 500-year flood. Attendees of the 2006 LHA conference in Cedar Rapids will recall the window. Wood, who lived in the city, is best known for his painting American Gothic. John Watts, co-owner of the Glass Heritage company in Davenport that spent the past year restoring the 24-by-20-foot window, said… ‘It is the first and only Grant Wood stained glass window. Everyone kept that in the back of their minds while working on it.’ Watts’ workers cleaned each of the window’s 8,000-plus pieces, painstakingly restoring color where needed. Cracks were soldered or glued and then reassembled in 58 panels. The blog 42N Observations comments about life near the 42N Latitude, particularly around Cedar Rapids, Iowa. 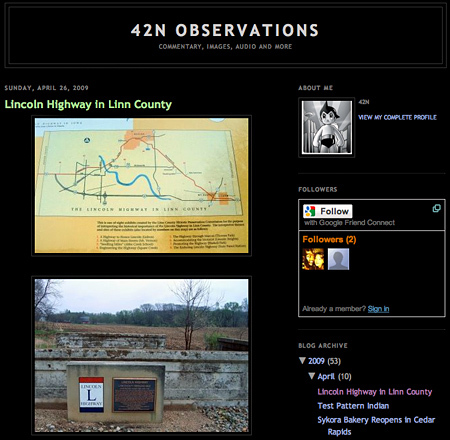 This post from a while back has four photos of Lincoln Highway segments and monuments in Linn County. Click HERE to visit, and click the photos there to see them larger.